Everyone’s gearing up for Dad’s Day – and Flag Day is today! 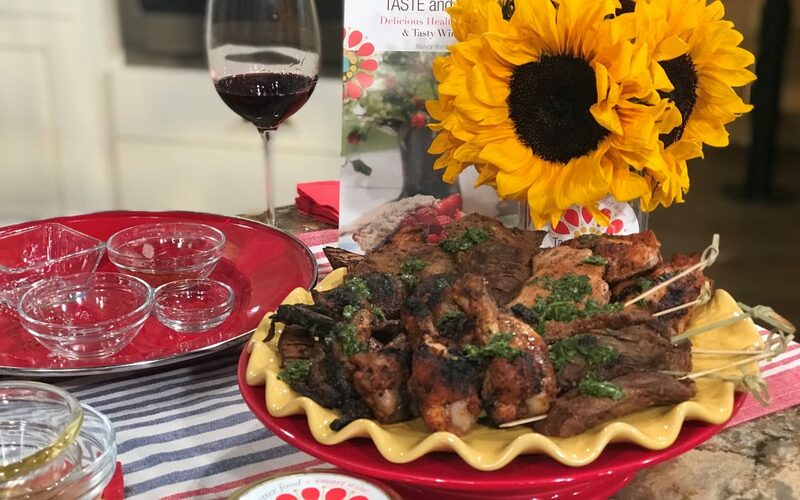 We’re typically cooking up for a crowd of well wishers on the holiday, Churrasco Steak with bright flavor-packed Chimichurri Sauce is an easy way to grill up steak for dad, family and friends, A glass of big red rich Malbec pairs beautifully with the big red meat! Chimichurri is a green sauce, which is also used as a marinade for grilled meats. It is originally from Argentina and Uruguay. Just like curry in India, each family has its own unique blend of ingredients. Chimichurri reflects influences from Argentina’s and Uruguay’s many cultures including Spanish and Italian. Churrasco is a Portuguese and Spanish word for beef or grilled meats. A different cut of meat is the distinction for countries from Europe to Latin American to Africa that serve Churrasco. In Argentina and Brazil, this BBQ was traditionally served on the ranch each night for dinner, with a twice a year special event that invited the local community. Mix all spices together in asmall bowl. Add brown sugar and mix thoroughly. Place 2-3 Lbs steak in aplastic bag. Add about 1/4 cup of dry rub. Close bag and massage to coat meat. Leave in fridge 1 hour or overnight. Grill or broil until desired doneness. Serve on grilled bread with Chimichurri sauce. Place garlic first in a food processor to chop. Add remaining ingredients and chop finely. Set aside for at least 30 minutes to let flavors develop.